A lot of code that we write relies on the current date in some way. Whether it’s cache invalidation, handling time sensitive data, or keeping track of durations, we usually simply perform comparisons against Date() — for example using Date().timeIntervalSince(otherDate). 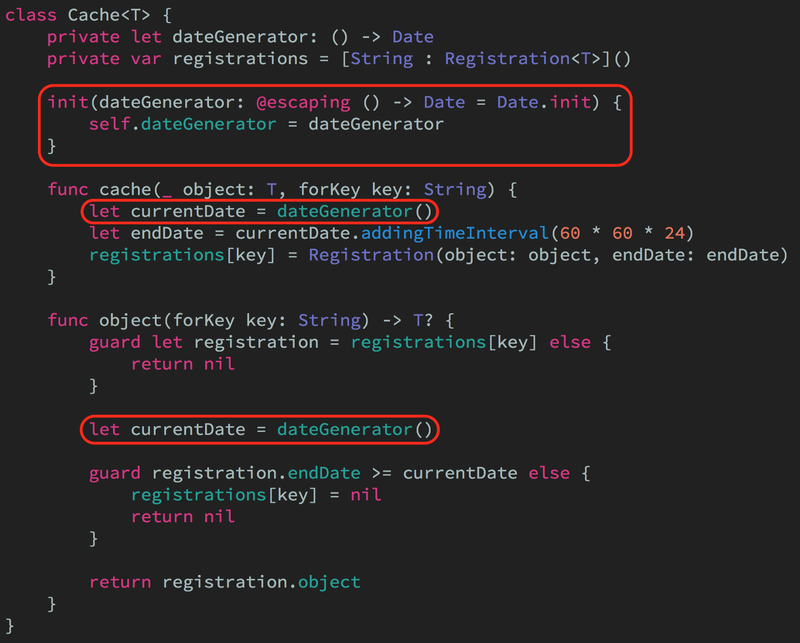 However, writing tests against code that uses such date comparisons can sometimes be a bit tricky. If the intervals are small enough, you could simply add waiting time to your tests (although that’s really not recommended, since it’ll slow them down, and is a common source of flakiness) — but if we’re talking about hours or days in between our dates, that’s simply not possible. As you can see above, we calculate an endDate for each cache entry, based on the current date, offset by 24 hours (in seconds). So how do we test this class in a predictable and efficient way? 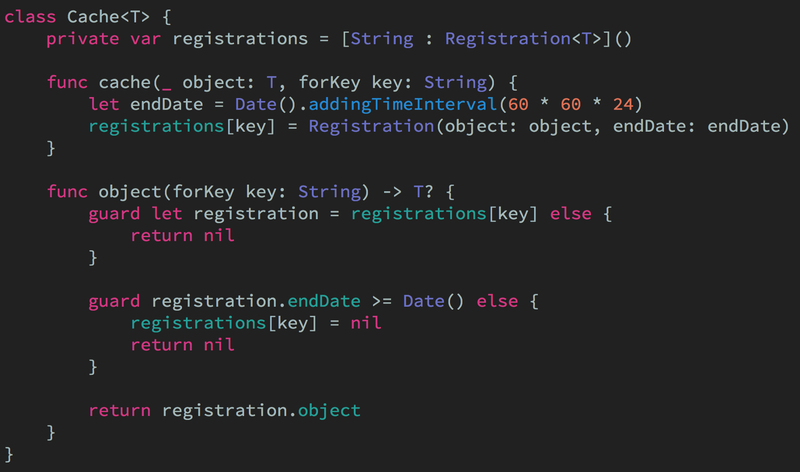 Let’s start by applying a technique from “Simple Swift dependency injection with functions” and make it possible to inject a function (we’ll call it dateGenerator) that generates the current date, instead of calling Date() directly. This will enable us to easily mock the current date in our tests. Add an object to the cache. Verify that the object is indeed cached. Time travel 24 hours into the future. Verify that the object is no longer cached. That’s it! 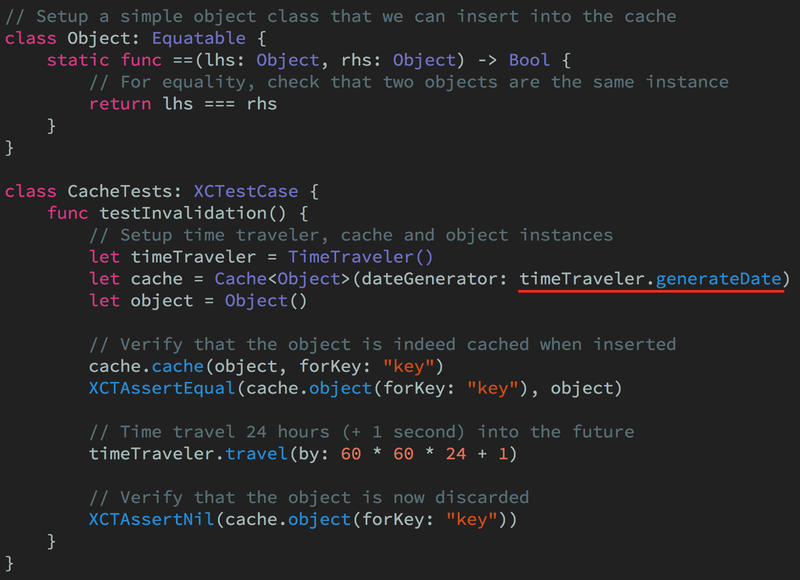 🎉 We now have a fast & predictable date-dependent test, without having to invent a lot of infrastructure or resort to hacky solutions like swizzling the system date. Do you have questions, comments or suggestions for upcoming weekly blog posts? I’d love to hear from you! 😊 Contact me on Twitter @johnsundell.